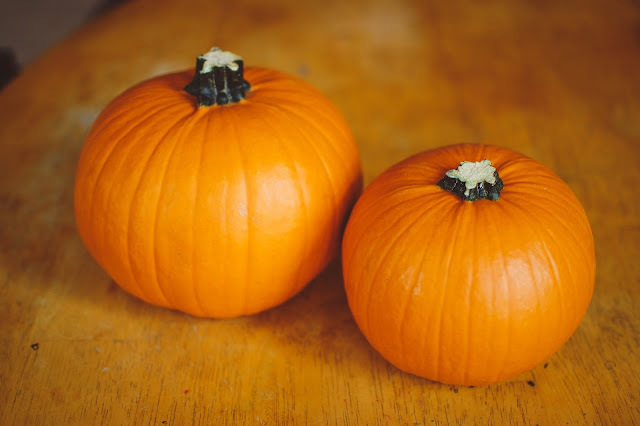 Confession: I have baked nearly a dozen pumpkin pies in my life, yet I have never actually cooked a fresh pumpkin. That recently changed about a week ago. 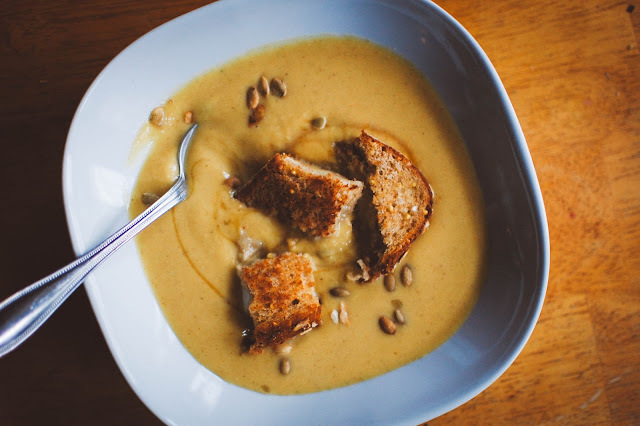 This recipe for pumpkin soup calls for canned pumpkin, which is all well and good, but I did want to try my hand at making it with fresh roasted pumpkin and it turned out quite well! I washed then cut the pie pumpkins in half. Scoop out the guts and seeds (save the seeds for roasting if you wish or to add to the soup, I tossed ours outside for the birds to eat). 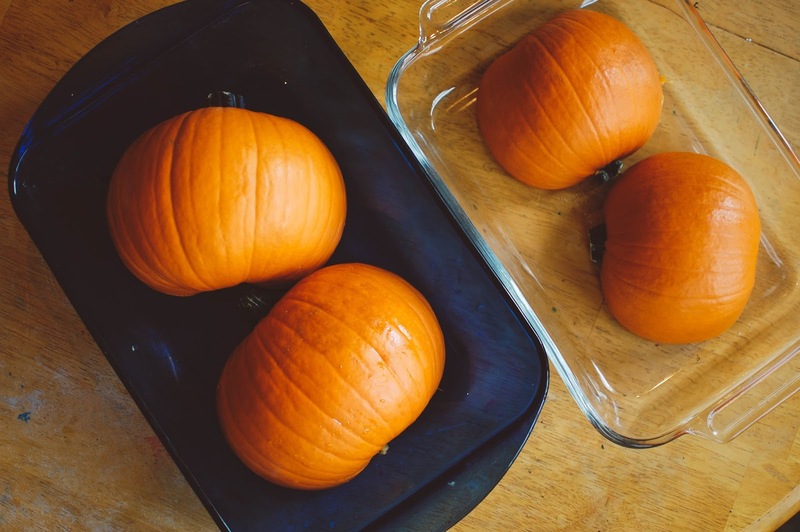 Place pumpkin halves cut side down in baking dishes and add 1/4 inch of water and bake in the oven at 350 degrees for 45 minutes to an hour. Cool, then scoop out the flesh with a metal spoon. 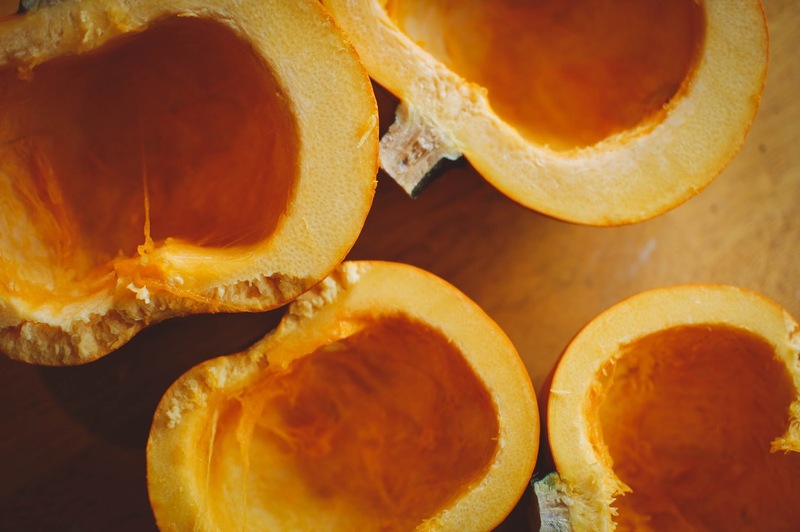 You can store the cooked pumpkin flesh in the fridge for up to 5 days. I found the fresh pumpkin to be preferable to the canned and I look forward to baking my very first fresh pumpkin pie this Thanksgiving. 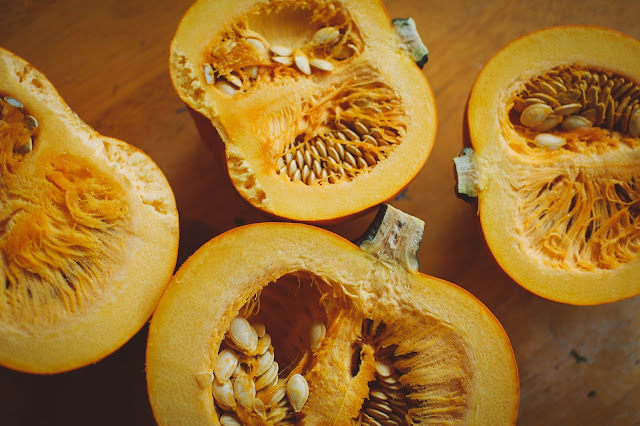 The scent held notes of squash and warm watery gourds and a touch of mellow sweetness akin to sweet potato. - Peel and core apple, dice. Repeat with onion. Preheat stockpot on stove at medium. 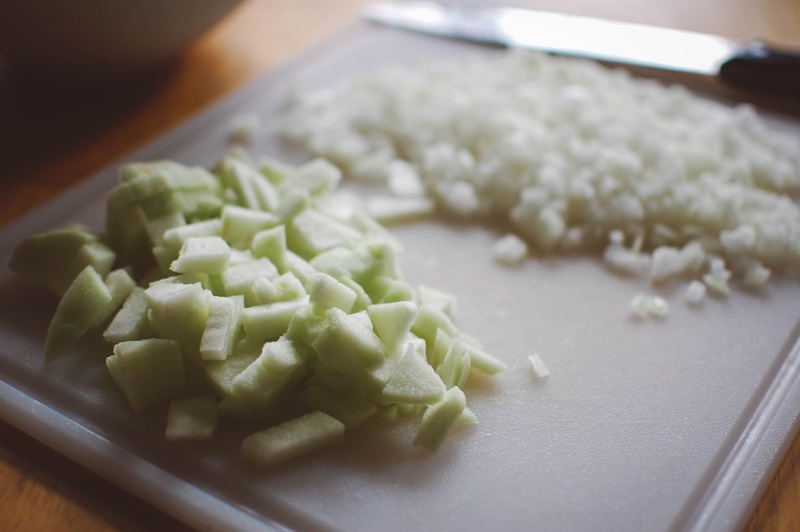 Melt butter and add apples and onions and sauté for about 8 minutes or until softened. 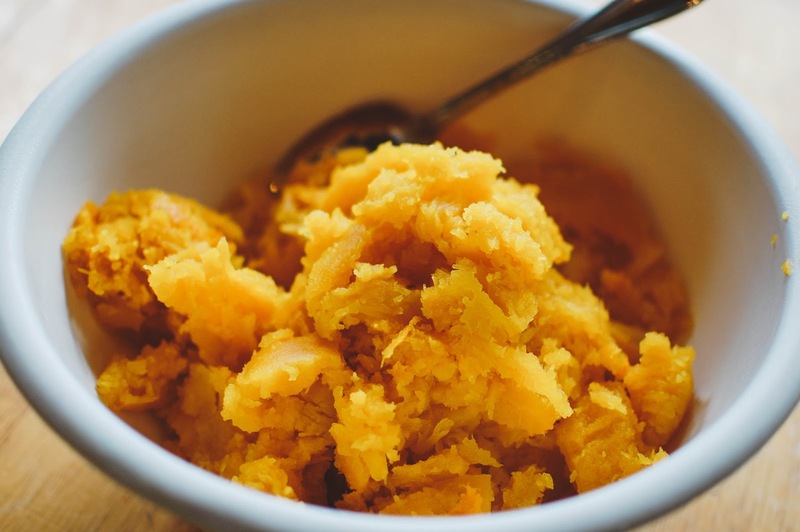 - Add pumpkin puree (or fresh scooped pumpkin! ), chicken broth, salt, pepper and spices. Stir and simmer for 10 minutes. Remove from heat and add half-and-half. - Use either an immersion blender (stick blender) or food processor to blend the soup mixture. Place pot back on the stove at low heat to keep warm. - Cut bread into 8 (1 inch) slices, arrange 4 slices on a cutting board. Thinly slice brie and place on the four slices, top with remaining four slices of bread. Butter the outsides. Basically, make a grilled brie sandwich. Cook the sandwiches in the pan on medium heat until golden brown, crisp and the brie is melty. Sprinkle with sea salt and thyme and slice into strips or serve alongside the soup. 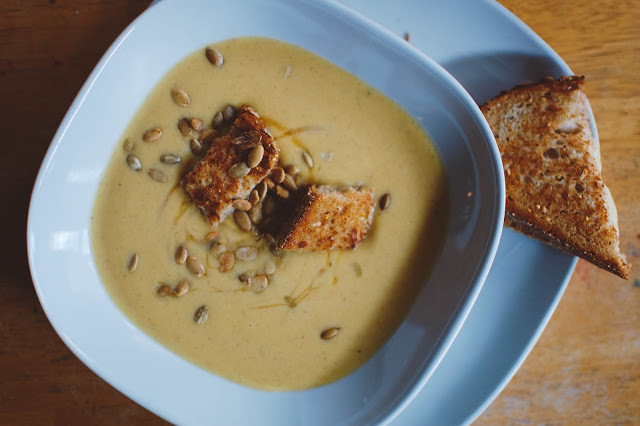 Garnish the soup by sprinkling in the pepitas and adding a generous swirl of maple syrup. Throw in the brie croutons or serve on the side. Or both. The girls do not enjoy pumpkin pie so when they heard I was making pumpkin soup there were some moans and groans. They were surprised (as was I) that they actually liked it. Adam enjoyed it too and so did my mom. I will be making this again next year. The brie. Mmmmmm! And if you are curious... the spice is minimal and not overly noticeable but adds nice flavor. Pumpkin soup! What say you? Oo I don't I know about pumpkin soup. I've always been hesitant but with this recipe I MAY be willing to give it a shot but the added apples just throw me off. Is it dessert or is it dinner.. hmm. Because I do love me some cooked apples. It's always worth a shot especially as the cooler weather comes springing around the corner. Surprisingly enough I haven't bought not one pumpkin this year. So unlike me! LOL! Delineating between dessert and dinner in the south is no mean feat. Between Sweet Potato Casserole served up with a heap of brown sugared pecans and cream and desserts that call for chocolate and saltine crackers it just kind of all gets jumbled together. The apples are not noticeable in texture since everything is blended together but I do think it adds a nice lightness to the soup. We are a little late in buying our pumpkins for carving. I think we will try sometime this week. I say, soup and croutons are my love language. So is brie for that matter. 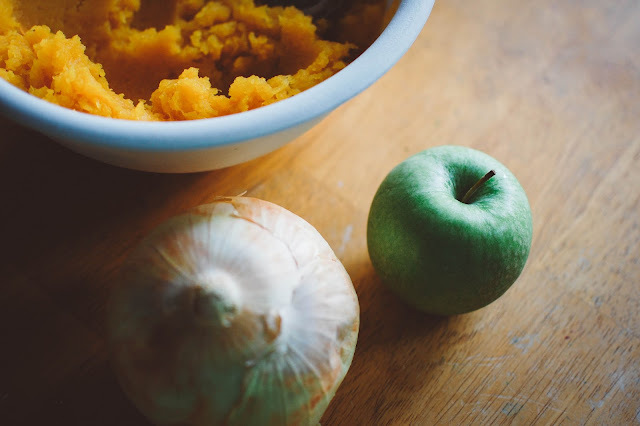 I have done squash soup and sweet potato soup, but I haven't tried pumpkin. An immersion blender, nice, I wish! About how much would you say this made? Would one work? I have one garden pumpkin I might try with it because it may not get so big, don't have plans for it yet. I was very comforted by that particular meal myself. It was a nice relaxing dinner. I would love to make some Butternut squash soup next. The immersion blender is an older KitchenAid one that was only around $30 at Walmart or some big box store like that. I don't have a lot of appliances, no toaster oven, no toaster, no electric can opener and no blender but I do love my stick blender. It is tiny and tucks away easy. Mmm, that sounds fantastic. I love the addition of the little toasted cheese sandwich croutons as well - always elevates a soup a bit, I think. :) Definitely going to give this a try, thanks for the recipe. I agree! I like the crunchy and cheesy texture against the liquid of the soup. And who doesn't like dipping things in soup?! I hope if you try it you let me know what you think or if you add your own twist to it. Have fun in Disney! I am excited for you!